Scenario is a 360-degree, 3D cinematic installation whose narrative, inspired by the experimental television work of Samuel Beckett, is produced through interaction between the audience and humanoid characters with artificial intelligence (AI). The title is a Commedia dell’arte term for the way in which the dramatic action depends on how actors and audience interact. A female humanoid character has been imprisoned in a concealed basement, along with her four children by her father, who lives above ground with his daytime family. This underground family lead the audience on an exploration of the basement labyrinth in search of possible ways they can together resolve the mystery of the family’s imprisonment, and so effect their escape before certain death. A series of shadowy humanoid sentinels track the family and the audience, rapidly interpreting and responding to audience behaviour by means of a sophisticated AI system, and physically try to block the family’s escape at every turn, creating a narrative that evolves according to the physical interaction of humanoids and audience. Scenario is an experimental study for a research project supported under the Australian Research Council’s Fellowship and Discovery Project funding schemes. Dennis Del Favero is an ARC Australian Professorial Fellow at COFA and the Faculty of Engineering, Director of the iCinema Research Centre, and Deputy-Director of the National Institute for Experimental Arts, all at UNSW. He is also a Visiting Professorial Fellow at ZKM, Germany, Visiting Professor at University IUAV of Venice, Italy and Visiting Professor at City University of Hong Kong, and editor of the Digital Arts Edition published by Hatje Cantz (Germany). He has held numerous solo exhibitions including at the Sprengel Museum, Hannover, ViaFarini, Milan and Neue Galerie, Graz, and has participated in major group exhibitions including Sydney Film Festival; International Architecture Biennale, Rotterdam; International Biennial of Contemporary Art of Seville; Videonale at Kunstmuseum Bonn; and Battle of the Nations War Memorial, Leipzig (joint project with Jenny Holzer). He is currently engaged in interdisciplinary art and science projects that explore the aesthetic relationship between human and non-human systems through the experimental reformulation of the relationship between the environment and society using digital media. Making its Australian debut in ISEA2013, Pure Land digitally recreates one of the famous, UNESCO world heritage listed cave temples in Dunhuang, northwestern China. Recognised as a religious and cultural gateway on the ancient Silk Road that carried trade between China, western Asia and India for over 1000 years, the 742 caves are today closed to the public on a rotating basis to ensure their preservation; this work transcends this limitation by immersing visitors in a 360-degree interactive panoramic projection theatre evoking the authentic experience of being inside one of the caves, thus bringing new, sustainable life to the aesthetic and spiritual drama of Dunhuang’s extraordinary paintings and sculptures. This 1:1 scale, virtual 3D facsimile of Cave 220, presented in iCinema’s Advanced Visualization and Interaction Environment (AVIE), exploits various digital image processing techniques, 2D and 3D animation as well as 3D cinematography to further develop AVIE’s experiential and interpretative capabilities. 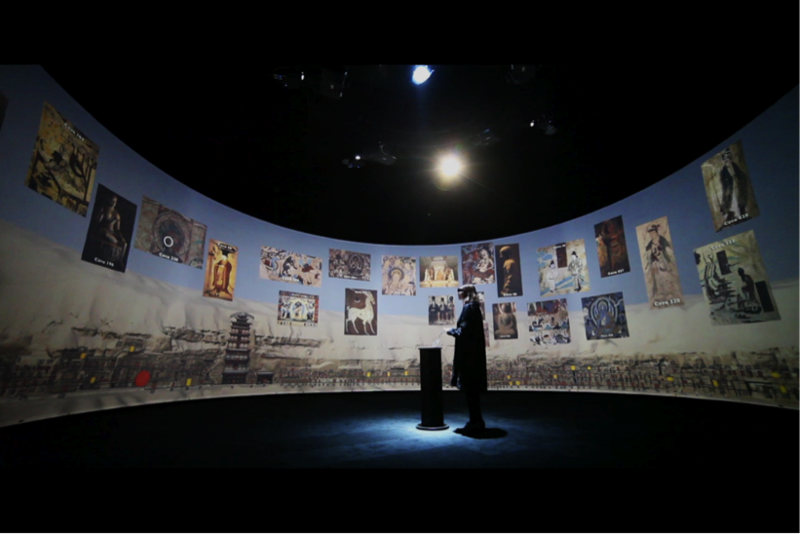 The installation, first exhibited publicly in Gallery360 at City University, Hong Kong (2011), was subsequently shown at the Smithsonian Institute in Washington, where it was described as being “the exhibition experience of the future” by Julian Raby, director of the Freer Sackler Galleries of Art. Keith Kennicott wrote in the Washington Post: “… at last we have a virtual reality system that is worthy of inclusion in a museum devoted to the real stuff of art.” (Nov 30, 2012). Dr Sarah Kenderdine researches at the forefront of interactive and immersive experiences for museums and galleries. In widely exhibited installation works she has amalgamated cultural heritage with new media art practice. She currently holds the position of Special Projects, Museum Victoria, and is a Visiting Assoc. Prof., Director of Research at the Applied Laboratory for Interactive Visualization and Embodiment (ALiVE), and also Director of the Centre for Innovation in Galleries, Libraries, Archives and Museums (iGLAM), all at CityU, Hong Kong. Friends of Dunhuang HK is a not-for-profit organisation active in conservation and education programs about the Mogao Grottoes. Established in 1943 by the Chinese government, the Dunhuang Academy has carried out many large projects that include conservation to restore and consolidate the cliff surface, caves, statues and murals, and extensive digitisation of cave interiors. Double District is a six-channel stereoscopic 3D video dance installation originally conceived for the ReActor, a hexagonal stereoscopic 3D back-projection environment. A series of solo and duet scenes, specifically choreographed and performed by Teshigawara, were recorded from six vantage points, in time synchronicity and stereo 3D. The installation questions the traditional notion of stage performance, where the audience is usually restricted to the seating area and the dancers direct their performances accordingly; in Double District the observer can freely choose a point of view and experience the performance in 1:1 scale and 3D depth. 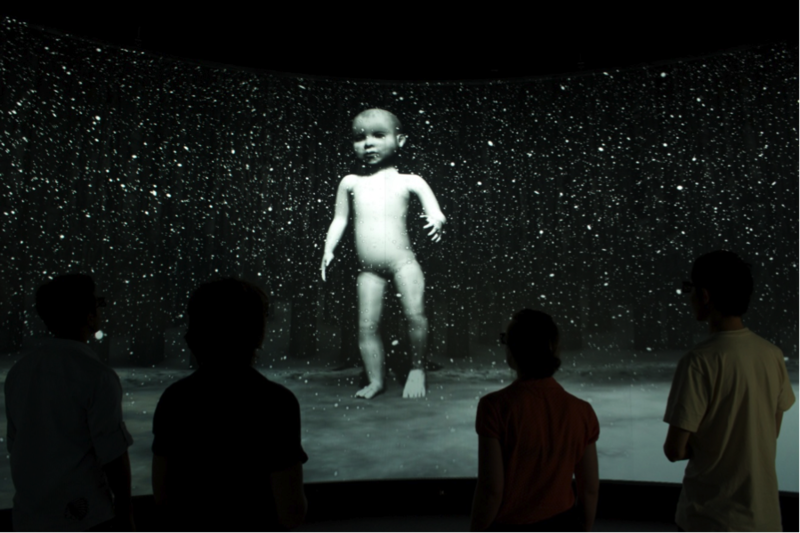 For ISEA2013, Double District will be presented in iCinema’s 360-degree AVIE (Advanced Visualisation and Interaction Environment) theatre. Volker Kuchelmeister is a media artist, a member of academic staff at UNSW’s College of Fine Arts, and a Research Fellow at UNSW’s iCinema Centre for Interactive Cinema Research. His work encompasses experimental film, expanded cinema, photography, video installations as well as the development of custom camera systems and projection platforms. He is particularly interested in human perception, the formation of memory, strategies in human-computer interactivity, and exploring and exploding the boundaries of the cinematic image. His work has been shown internationally at museums, galleries and festivals including ZKM Centre for Art and Media Karlsruhe, Centre Pompidou, and Powerhouse Museum Sydney. Co-produced by: Karas (Tokyo), Epidemic (Paris / Berlin), Le Volcan Scène Nationale, (Le Havre) and UNSW iCinema Centre (Sydney), and kindly supported by Museum Victoria.